"Snow is Falling..." is a celebration of winter, with music specially chosen to reflect the many and varied moods of the season. 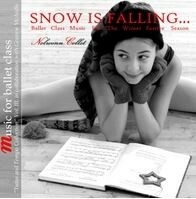 In "Snow is Falling..." Nolwenn Collet has brought together extracts from the larger dance repertoire and beyond. Many of the works chosen draw on nature as a source of inspiration. Weiterführende Links zu "Musik-CD Collet NC003 Snow is Falling"
Kundenbewertungen für "Musik-CD Collet NC003 Snow is Falling"